Michele O’Marah presents her well-known video portraits of Los Angeles-based artists, musicians, and friends, inspired by Andy Warhol’s Screen Tests (1964-66). At CAF, O’Marah will create a full-room, multi-channel installation of these videos that reads as a larger than life portrait of her community. O’Marah's oeuvre explores the effects of popular culture, deconstructing in particular Hollywood genres and stereotypes, while involving the arts community as an active participant. Los Angeles-based artist Michele O’Marah received her B.F.A. from the Tyler School of Art, Philadelphia, PA. O’Marah is represented by Brennan & Griffin in New York, NY. 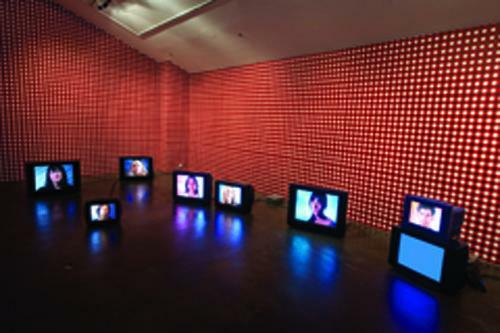 Her work has been exhibited at the London Institute of Contemporary Art, London, UK; Museum of Contemporary Art San Diego, San Diego, CA; and the CCAC Wattis Institute for Contemporary Arts, San Francisco, CA. Casa Magazine, Santa Barbara, CA; ForYourArt, Los Angeles, CA; Lady E Photography, Carpinteria, CA; Santa Barbara Independent; Santa Barbara News-Press; James Van Arsdale and Kimberly Hahn, Santa Barbara, CA; and Wayne McCall & Associates, Santa Barbara, CA. This exhibition was made possible by the generous support from The James Irvine Foundation.